The two most common causes of pain in the bottom of the heel, the arch, or both the heel and the arch, are heel spurs and plantar fasciitis. 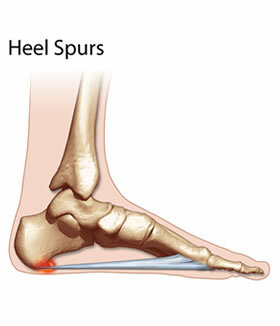 A Heel Spur is a piece of calcium or bone that sticks out from the bottom of the heel bone, and lies within the fibers of the plantar fascia. When walking, the spur digs into the plantar fascia and causes small micro-tears in the plantar fascia. 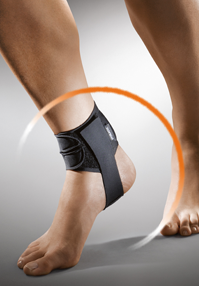 This produces inflammation and pain in the heel, which at times may radiate into the arch. The plantar fascia is a thick, ligamentous connective tissue that runs from the calcaneus (heel bone) to the ball of the foot. This strong and tight tissue helps maintain the arch of the foot. It is also one of the major transmitters of weight across the foot as you walk or run. That's why tremendous stress is placed on the plantar fascia. Since heel spurs are not an indication of pain themselves unless fractured, treatment is usually aimed at the cause of the pain which in many cases is plantar fasciosis. Treatment of plantar fasciiosis includes; rest until the pain subsides, special stretching exercises and if required orthotics may be prescribed.